Kale is one of those things I thought I’d always hate. I am not a fan of dark, bitter greens in general (no swiss chard or collards for me, thank you very much), no matter how they may be dressed up. But, during my last visit to South Carolina, I ordered a pork entree at dinner one night, and the pork was resting on a bed of thinly cut kale, dried cherries, and some other things I can’t remember. 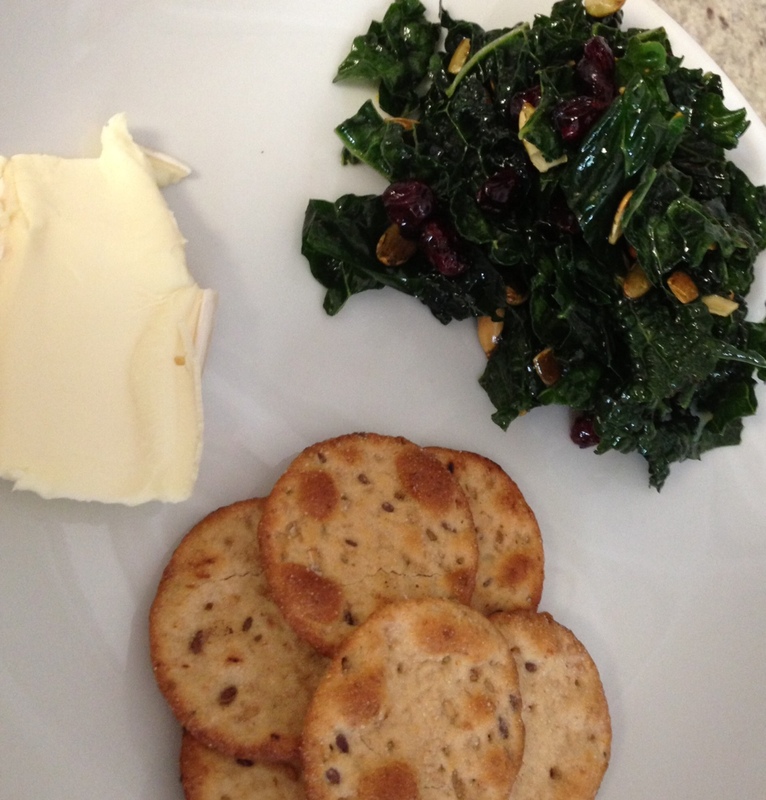 I figured I’d try a few ribbons of kale with a big bite of pork and cherries… and it wasn’t awful. And I didn’t die. And I was shocked. Last week, I was on vacation in Vegas with my husband and some friends, and we visited the giant buffet in our hotel, as one does when visiting Sin City. As I was making my second or third round of the buffet, surveying a row of salads, some total stranger decided she wanted to be my friend, and started waxing poetic about the virtues of kale, and how wonderful the kale salad in front of us looked. If we’re being honest, I kind of wanted her to stop talking so I could walk away and dig into the basket of tiny fried chicken legs that was sitting on my plate – so I took a little scoop of the kale salad, hoping it would shut her up. And it did. Since the kale salad was taking up valuable real estate on my plate, I figured I had to try it. To my surprise, it was delicious! It was lemony, and tangy, and sweet, and the kale had a pleasant chewiness to it. TWO kale experiences that went well? Surely something must be wrong with me. 1.) Rip (or chop) your kale into bite-size pieces. Place it into a large bowl, and drizzle it with one tablespoon of the olive oil, and add a pinch of sea salt. Use your hands to work the olive oil into the kale leaves, until the kale is completely coated and starting to wilt just slightly. 2.) In a small bowl, whisk together the remaining tablespoon of oil, the lemon juice, honey, red pepper flakes, and a pinch each of salt and pepper. Pour the dressing over the kale and toss until the kale is evenly coated. 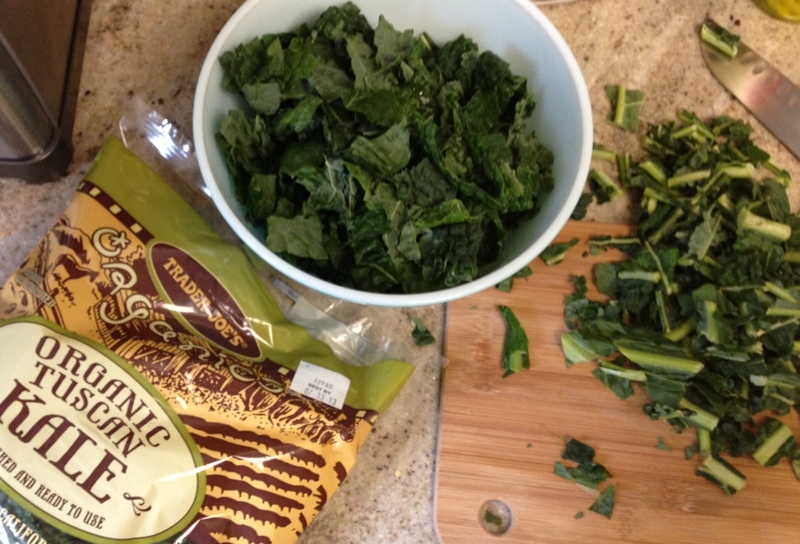 Cover the bowl, and place the kale in the fridge for 2-4 hours, to allow it to continue softening. 3.) 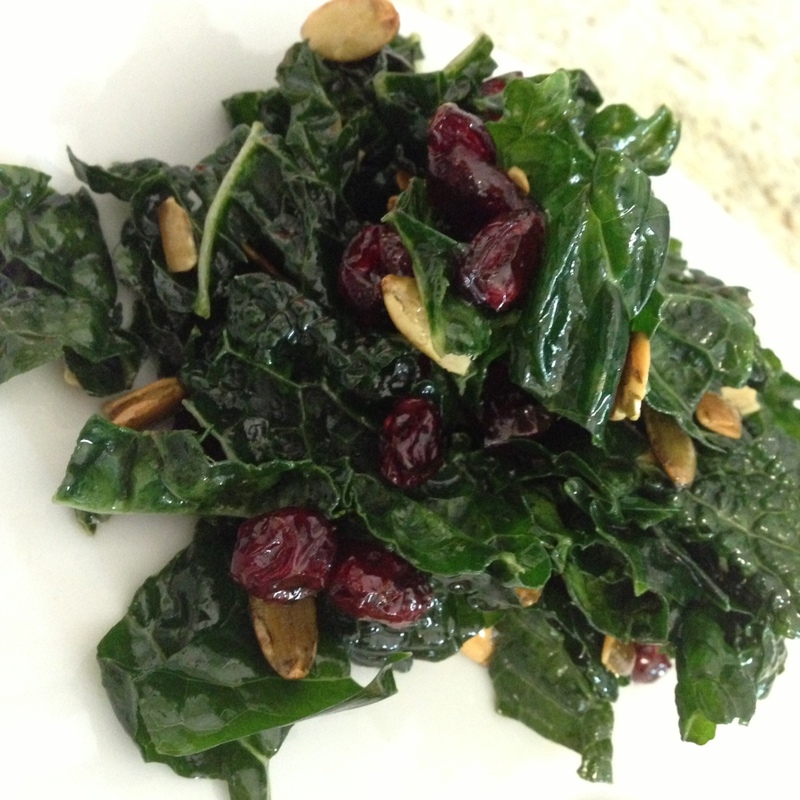 When the kale has been chilling for a few hours and you’re ready to enjoy it, add the dried cranberries and pepitas, and combine everything well. Serve cold. If you had told me a year ago that I would truly enjoy kale in any way, shape, or form, I would have told you you were completely insane. I still can’t believe how much I love this salad – the tart lemon, the sweet cranberries, and the salty pepitas are a great balance to the mild bitterness of the kale. It’s just… perfect. What previously hated food will be next? ?